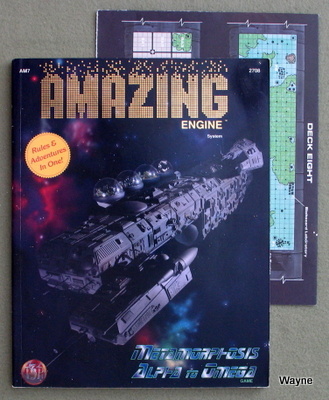 "The AMAZING ENGINE™ game system is more than just a single role-playing game, be it fantasy world or science fiction universe. Instead, the AMAZING ENGINE system provides the basics for creating a wide variety of role-playing settings — anything from consulting detectives investigating fairy realms to deadly aliens stalking hi-tech space marines — and as much as can be imagined in-between. To do this, the AMAZING ENGINE system consists of two parts. 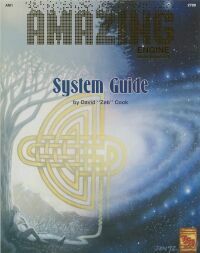 The first part is this book, the System Guide. Here one finds the basic rules for creating player characters and having those characters use skills, fight, and move. These rules and procedures are found in all AMAZING ENGINE settings. The System Guide also details how players and GMs can change settings while transferring benefits player characters have gained from previous play. The second part of the AMAZING ENGINE system are the different settings to play in. Each setting is called a universe and is described in its own book, naturally called Universe Books. 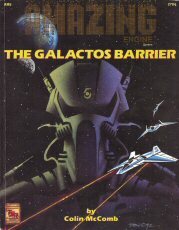 Each Universe Book is a complete role-playing game and only requires the System Guide to play. It is not necessary to buy every Universe Book in order to play in the AMAZING ENGINE system. Universes range from hard science-fiction worlds to strange fantasies set on alternate Earths. Gamemasters can run campaigns in just a single universe, run science-fiction or fantasy universes only, or play in both trying whatever universe catches their fancy. "'It's a right pea-souper, innit, guv'ner! No tellin' what kinds a' bogies're out slippin' 'round tonight' The fish vendor tips his filthy porkpie hat to the passing inspector, who hardly notices the vague shape lurking in the shadows of the narrow alleyway behind him. 'Certain and it's not a fit night out fo—' His voice is cut off sharply as a clawed hand closes around his throat, its iron nails digging into his skin. His screams shatter the silence of the foggy waterfront. Inspector Prescott realizes, with a start, that he has been standing rooted to the pavement, while a black annis has just killed another victim. He's been warned that one's been about, striking silently and without warning, but he certainly never thought to get this close to one. From behind him comes a hideous cackle. Turning, he sees a misshapen, four-limbed creature that seems to be sprouting leaves. In its bony hands it clutches a large knobby club. 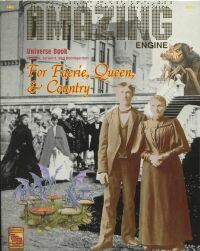 For Faerie, Queen, and Country is the first fantasy Universe Book created for the AMAZING ENGINE™ game system. The setting: Victorian England, 187-. The Tuatha de Danann are represented in Parliament. America is a British penal colony And your character? She could be a governess to a family in Bloomsbury, skilled in herbal lore and fairy lore because she was raised in Ireland. He could be a consulting detective, half-faerie himself, with training in phrenology. Or, your character might be a full-blooded Tuatha de Danann, bent on wreaking mischief throughout London! Step into the universe of For Faerie, Queen, and Country. And don't forget the bit of cold iron for your pocket!" Clearly inspired by Aliens and Starship Troopers, Bughunters adds depth and a novel twist. The book comes with a fold-out map of nearby star systems, much like that of the 2300AD RPG set. "The BUGHUNTERS™ game is a role-playing simulation of action adventure in a gritty, not-too-distant future. It is a time in which humanity has begun to colonize the worlds of other stars, but the race has at best a tenuous hold on those worlds and is beset by many dangers. The environments of the colony worlds are often hostile, and colonial resources are limited. But what's worse, a host of inimicable aliens prey upon the colonies and have even begun to threaten the safety of Earth itself. 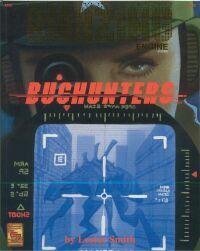 Player characters in the BUGHUNTERS game are "synthetic humans": vat-grown clones of human volunteers, specially modified to serve as starship crews, combat teams, and general trou-bleshooters for the human race. As members of the United Terra Reconnaissance and Peacekeeping Force (UTRPF), these "synths," or "syn-ners," are often all that stands between the human race and extinction at the hands of a cold and hostile universe. Synths are tougher than normal humans in many ways. Physically, they have been enhanced to react more quickly, to keep moving longer, and to endure more punishment during battle. Mentally, they are able to withstand the psychological stresses of hyperspace travel, a situation that disorients normal humans, sometimes to the point of madness. Psychically, they have been trained to bear up under the stresses of combat, whether it be against human terrorists or hideous, unknown aliens. And they are supplied with the best equipment that human technological ingenuity has to offer. As members of UTRPF ("utter-puff" in synner slang), synners are the unsung heroes of the human race, a buffer from its enemies without, protectors from its enemies within. But for all of that, they are still individuals with hopes and dreams of their own, struggling as much as anyone else to make something of their lives." "Imagine an alternate earth, one somewhat different from our own? and earth that has always been home to elves, dwarves, centaurs, and other fantastic folk, an earth where magic has been scientifically studied and quantified, and now serves as a clean power source for modern devices like crystal balls computers, flying carpets, and autocarriages . . . 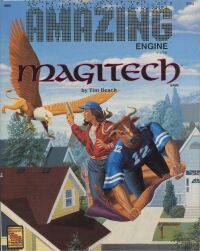 The world of the MAGITECH Game is Earth in the 1990s-with a few twists. Magic has long been recognized and studied, so that normal technology is stunted, and magical items are commonplace modern conveniences. Other intelligent species evolved with humankind, and now elves run a powerful Central American nation, minotaurs govern the nation of Texas, and intelligent reptiles control Southeast Asia. European colonization was halted by native magic. and nations of Africans and Native Americans were established long ago, and remain powerful today. While most people lead normal lives, going to work and school, other choose a life of adventure, exploring the ruins of a Europe devastated at the end of World War II, searching for treasure in the jungle temples of a Venus colonized more than a millennium ago, or an adventure of modern, magical civilization." "Daisonne Morione stood on the bridge of her cruiser, surveying the enemy fleet just now becoming visible across the vacuum that separated them. Daringly, the flagship was displaying the colors of the outlawed S'farna pirates.. To her left, her first officer bared his fangs in a rare show of emotion. "We can't allow this affrontery. Emperor! Shall I call for emergency procedures?" The lupiral shook with rage, barely contained despite his years of Domain service. "That won't be necessary, Sho. Please, continue watching the screen." Daisonne's voice held steady, its timbre betraying nothing. She gestured calmly. "There, at ninety. Watch that glow." The bright spot in question grew larger, encompassing most of the fleet in its brilliance. As the glow faded, the fleet reappeared—no longer metallic and shining, as it had been only moments earlier, but stony gray and dull. All motion had ceased; no lights blinked, no tracking devices swiveled. "Our Harmonian has performed his Coda Well" intoned Daisonne Morione. The Galactos Barrier had been played upon the enemy fleet, and the music of the spheres had been their swan song. Intergalactic empire building, a magic system that marches to that proverbial different drummer, and a choice of player-character species including amorphous blobs, snakelike bipeds, and purple-scaled, four-armed powerhouses; these are just a few of the elements included in this Universe Book designed for play in the AMAZING ENGINE™ game system. All the rules you need to enjoy adventures set in the Morione Domain are included in this booklet. You must have the System Guide in order to play." "The year is A.D. 4485. Technology has advanced to the point that the entire solar system is populated, a central mainframe computer links every household, and normal humans are no longer genetically capable of violence. Life, however, is far from dull. The Knights of Arthur's Round Table live again, and they have molded civilization to their own liking. Masking technology's function within the trappings of medieval form, these nobles travel upon robotic horses, bearing electronic swords and armor. Meanwhile, the wonders of the royal court come to life again as Morgan Le Fay and others weave their spells of intrigue and deceit in hopes of bringing ruin to the king of Camelot. 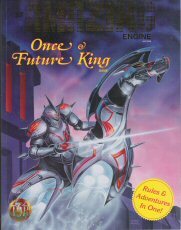 Once & Future King is the fifth release for the AMAZING ENGINE™ game system. This book contains the core rules for the AMAZING ENGINE™ system as well as all of the supplemental rules for role-playing characters in a world of high technology and chivalric knights all rolled together. The universe section includes a detailed system of character generation, rules for chivalric combat, a list of equipment including armor and weapons, fantastic beasts, famous and infamous nonplayer characters, an introductory adventure, and more. The road to Camelot begins with the very first step!" "If you got the edge, you got it all. Surf the Net, ride the new tech, twist it. If you lose your edge, you might as well be a zombie. Keep it while you can — a cybernation of millions is ready to take you down. The opposition has more money. Belters have newer genes, and the young Netrunners have slicker programming, but you're still a better breed of human. You've got tech under your skin and a vision in your soul — if you still have a soul. 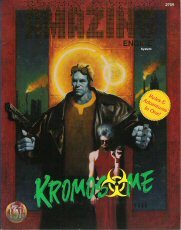 KPOMOSOME includes complete rules for a dark future setting of biotechnology, cybernetic enhancements, a living computer net, and the struggle for fame, wealth, and survival in a hostile and crumbling world. Sign on for the most mind-bending, body-altering role-playing game ever. Stay alive, get rich, and try to stay human." "Yes, it's true! Aliens really did endorse all three Presidential candidates in the last election. And they continue to give the First Lady advice on her hair! Of course, the power behind the throne is none other than the King of rock and roll himself, alive again after having faked his death—or is that really his clone? That would explain the multiple sightings all across this great country. Most people today don't believe in all this "non-scientific" and "unproven" stuff, but as a reporter for one of those high-circulation, colorful supermarket tabloids, you know they're wrong! It's those so-called crackpots who hold the secrets to everything, but they're afraid to reveal them for fear that groups like THE CONSPIRACY will destroy them. But those sorts of threats have never stopped you. The truth must be told! In living color with three-inch headlines and as many lurid photographs as possible! 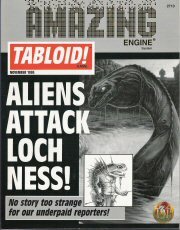 All the rules you need to be a TABLOID? 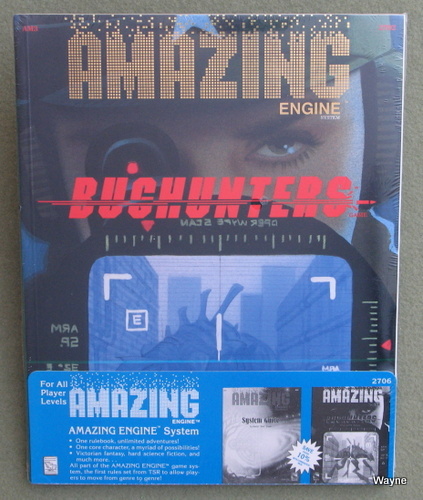 reporter are included in this book, even the AMAZING ENGINE®System itself! So what's stopping you? Go get that story!" "Welcome to the strange world of the Starship Warden, where sentient plants and intelligent animals share the crowded decks of a giant spaceship with mutants and primitive pure-strain humans. This is the world of Metamorphosis Alpha to Omega — a world of weird science where centaur cowboys tend intelligent cattle while keeping a sharp eye out for minotaur rustlers; a world where Amazons hunt robots and your most trusted friend could be an android in disguise; a world where mutant and pure-strain humans strive to come to terms with one another, while other new races fight to establish their own niches. All the old knowledge about how the ship's technology works, even the fact that they are aboard a spaceship at all, was lost long ago. Will your player characters survive all these challenges and be the ones to unravel the ship's many secrets and initiate Operation Exodus? * Originally published in 1976, Metamorphosis Alpha has been adapted, expanded, and updated to fit in the AMAZING ENGINE system. * This is a complete, stand-alone role-playing game: all the rules you need to play are included within. 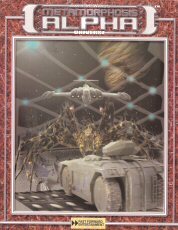 * This rulebook includes new skills, mutations, new races, high-tech weaponry and gadgets, and robots, as well as a detailed description of the ship's many ecosystems." "The Future isn’t in your future.... In the vastness of outer space a science ship rams into something that has been left undetected for 99,000 years. The players try to survive while chaos attacks their ruined ship from all sides. Using an all-new 3d6 system of play, players and game masters will be quickly and easily setting up and playing quickly. Character generation is not a one-time event in Metamorphosis Alpha, and players evolve their characters as the game develops. The dangers that you face today may be quite different in a very short time. This is an all-new 3rd Edition of the very first science fiction role-playing game. First published 25 years ago, this game has been updated and reworked for today’s sophisticated gamer. Designed by the award-winning James M. Ward."